Anctil, Pierre and Yves Frenette. "Franco-Americans". The Canadian Encyclopedia, 17 March 2016, Historica Canada. https://www.thecanadianencyclopedia.ca/en/article/franco-americans. Accessed 23 April 2019. From the mid-19th century to around 1930, over 900 000 francophone Québecois emigrated to the US. They migrated in waves, especially after the American Civil War, and around 1890 managed to feel at home and, in a few generations, adopted the habits and customs of their new surroundings. From the mid-19th century to around 1930, over 900 000 francophone Québecois emigrated to the US. They migrated in waves, especially after the American Civil War, and around 1890 managed to feel at home and, in a few generations, adopted the habits and customs of their new surroundings. Their descendants are known as Franco-Americans, though the term did not appear until the end of the 19th century. The approximately 5 million Franco-Americans constitute the largest element within the Québec diaspora in all North America. 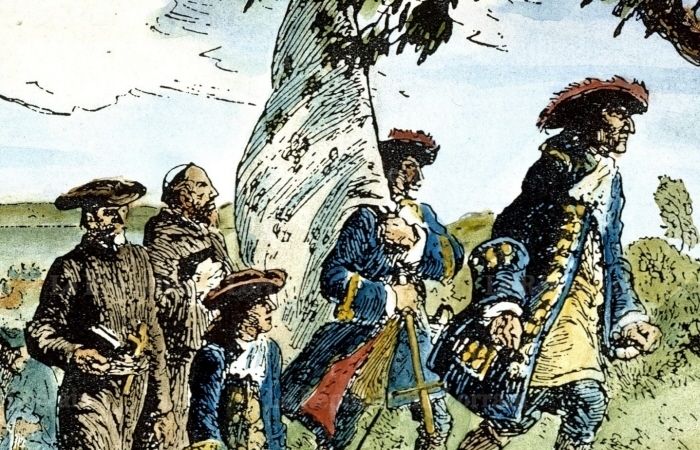 The magnitude of the huge migration ("La Grande Hémorragie") shook Québec society and led to a renewal of nativism in New England, where almost half the emigrants settled. Most of the emigrants came from rural areas of Québec. They were looking for financial and job security, especially in textile and shoe factories. Franco-Americans' job skills diversified over time, however, and they gained access to commercial positions and to the liberal professions. Around 1930, when the Great Depression put a stop to emigration, the New England states had gained a significant Franco-American population, most of it in industrial cities like Lowell, Lawrence and New Bedford (Mass), Woonsocket (RI), Manchester and Nashua (NH), and Biddeford and Lewiston (Me). These French Catholic Franco-Americans created "little Canadas" in some districts in the major American cities, reproducing their cultural life and French-Canadian religious institutions. Until Second World War, and despite their Americanization, the descendants of the Québecois emigrants probably managed to preserve their identity better than other ethnic groups. Several major figures in Québec history had Franco-American roots, including journalist Olivar Asselin, writer Honoré Beaugrand, essayist Edmond de Nevers and ultramontane thinker Jules-Paul Tardivel. Some Franco-Americans were repatriated to Canada around the beginning of the 20th century and formed the core of several francophone settlements in the West (see French in the West). With time, however, most Franco-Americans succumbed to the attractions of the American way of life and the English language, especially since they lived primarily in urbanized surroundings. Nevertheless, today some Franco-Americans continue - though primarily in English - to take an interest in their historical roots, and preserve their network of intraethnic relations and certain folkloric or gastronomic traditions. Some Franco-Americans - eg, writer Jack Kerouac and athlete Napoleon Lajoie - have had a major impact in the US. The secularization of Québec society and its profound changes since the Quiet Revolution have caused Franco-Americans and Québecois to have less in common than they once had. Yves Frenette, Étienne Rivard and Marc St-Hilaire, eds. La francophonie nord-américaine (Québec: Presses de l’Université Laval, 2012). Coll. Atlas historique du Québec.